Well organised, very friendly staff, pilots really informative and definitely recommended for anyone visiting NYC. Really professional outfit first class tour would recommend - highlight of the New York trip. I was good BUT my reason for taking this particular tour was that it went over Yankee Stadium very disappointed that it didn't he just pick it out from a distance . On line it showed pictures of the tour going over the top of Yankee Stadium and it wasnt a game day. 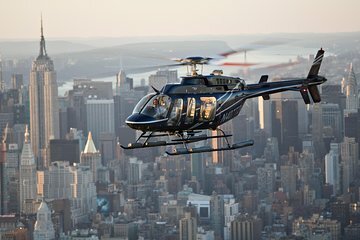 I would recommend your helicopter rides to my friends but in saying that may be one that is not so expensive when you dont get all you think you are going to get. Was hoping to fly over Manhattan not just up the Hudson, a good guide though managed to point out all the places of interest. This was the first time on a helicopter for my wife and she loved it seeing the sights from above.